Original watercolour held by Ontario Government Art Collection. 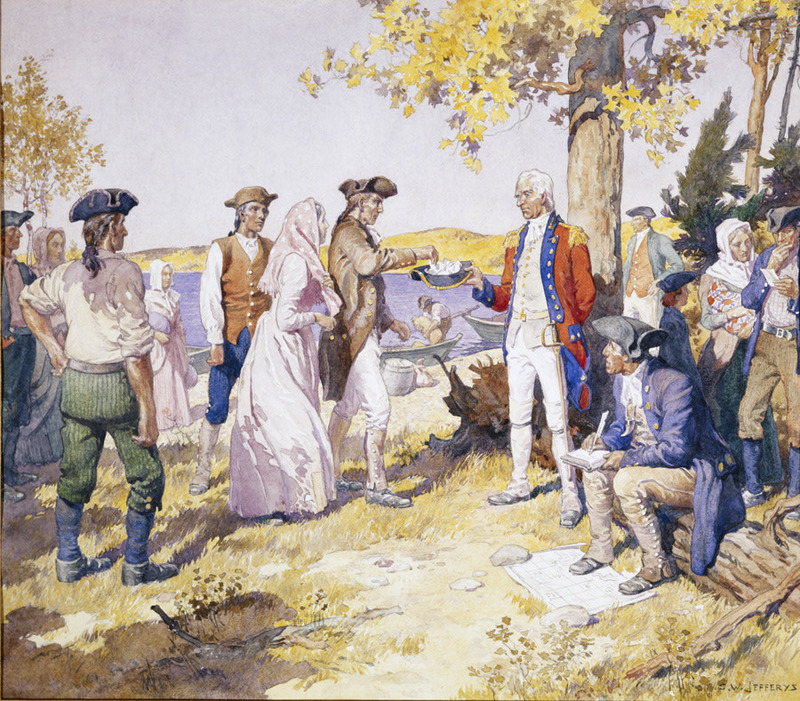 Early in the fall of 1783, in accordance with instructions from the British government, Sir Frederick Haldimand, Governor-General of Canada, sent surveyors to lay out lands for Loyalist settlement in the country along the St. Lawrence and Lake Ontario above Montreal. Before winter the Bay of Quinte district had been surveyed and divided into lots and townships. Next spring the lands along the St. Lawrence were laid out. By the early summer the Loyalists were on their way to their new homes. Most of these settlers were disbanded soldiers from the Loyalist regiments, principally from New York, and it was planned that as far as possible, members of each corps should be given lands adjoining each other, and care was taken that Protestants and Roman Catholics should besettled in separate groups. 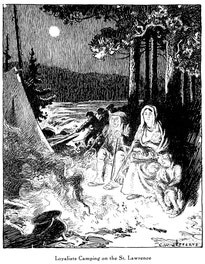 Thus the Roman Catholic Highlanders of Glengarry were placed near their French-Canadian co-religionists at the western end of Quebec settlement. 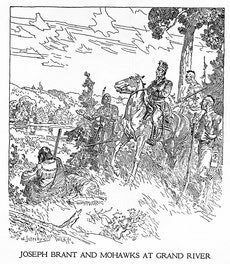 As a general rule, the grants were proportioned to the military rank of the settler: the higher officers received 5,000 acres, captains, 3,000; subalterns, 2,000, and non-commissioned officers and men 200 acres. As each detachment reached its assigned destination, it was landed, and the work of apportioning the grants of land began. To secure an impartial distribution, papers bearing the numbers of the lots to be granted were placed in a hat. Each applicant took one or more of these papers from the hat, and thus in a double sense drew his lot. Some dissatisfaction naturally arose from this haphazard method, as the locations varied considerably in quality, but adjustments were soon made, and a rough and ready equalization of allotments was reached without much delay. The settler made his way to his homestead, and bent himself to the stern task of building his life anew. Most of them were destitute and entirely dependent on the support of the government for their start. Food, clothing, a few tools, such as axes, saws, spades, and hoes, some seed wheat, a few cattle, and muskets for hunting were provided. For the first years the settlers had a hard struggle for existence. The year 1788 was known as the "hungry year," when crops failed and the settlement was on the verge of starvation. Gradually by hard and unremitting labour they improved their condition, and by 1792, when the new Province of Upper Canada was formed, most of them were well on their way to independence, and a rough comfort and security. The picture shows the drawing of the lots. 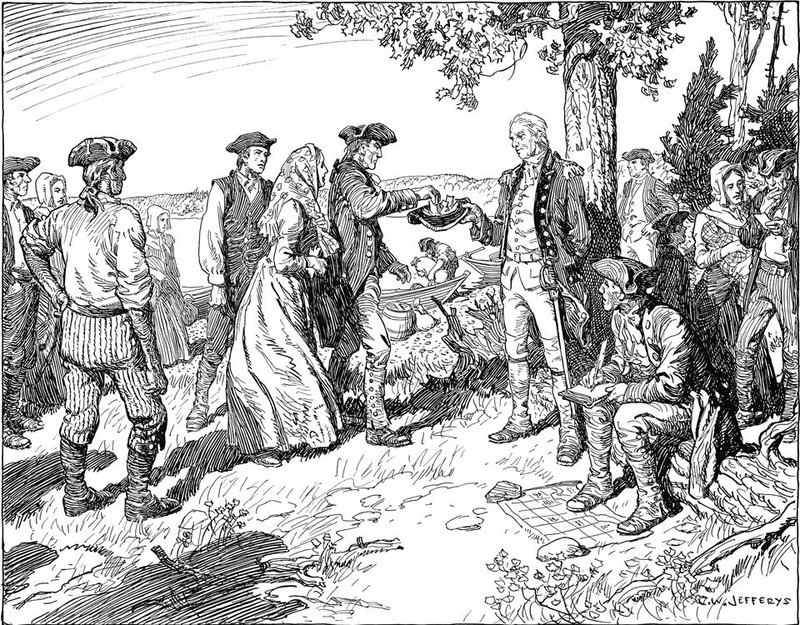 One of the leaders of the party holds the hat: beside him is seated the assistant surveyor, who acted as the land agent and registrar, writing down the name of the settler, and the number of the lot he has drawn, and marking his location on the map outspread at his feet. All wear rough, coarse clothing, often of homespun, which shows the effect of wear and tear and exposure to the weather. Their hands and faces are tanned by wind and sun. Some have remains of military uniforms, an officer or two in a red coat is seen. Some of the men wear long-tailed coats and corduroy breeches, with buckles or straps at the knees, rough woollen stockings and thick, heavy-soled shoes. The women wear poke bonnets, or 'kerchiefs over their heads, high-waisted dresses, with tight, pointed bodices and full skirts. “Canadian Academy exhibition strikes a more modern note; fifteenth [sic, was 50th] annual show opened at Art Gallery.” In Mail and Empire, Nov. 30, 1928, p. 8. MacPherson, Mary-Etta. “Canadian art in review: gleaning from the fiftieth exhibition of the Royal Canadian Academy, held in Toronto recently.” In Canadian Homes and Gardens, Feb. 1929, p. 20-21. Illus. “Royal Canadian Academy opens here this evening…” In Toronto Star, Nov. 29, 1928, p. 13. “R.C.A. select pictures for London exhibition.” In Evening Telegram, Dec. 8, 1928, p. 33. “R.C.A. show opened with private view; fifty-first annual exhibition house in Art Association galleries.” In Montreal Gazette, Nov. 23, 1929, p. 7. Jefferys, Charles W. “The Fiftieth Exhibition of The Royal Canadian Academy.” In The Journal Royal Architectural Institute of Canada., v. 6, no. 1, Jan.1929, p. 6-10. Illus. Paterson, Gilbert. (1933) The Story of Britain and Canada. Toronto, Ryerson, 233 p. Illus. Henry, Lorne J. and Paterson, Gilbert. Pioneer Fays in Ontario. Toronto, Ryerson, 1938. 234 p. Illus. Gibbon, John Murray. New world ballads. Toronto, Ryerson, 1939. 177 p. Illus. McCarthy, Pearl. “Artist tells vivid story of Canada.” In Globe and Mail, Sept. 26, 1942, p. 8. Illus. Middleton, J.E. The Romance of Ontario. Toronto, W.J. Gage and Co., 1947. 267 p. Illus. Encyclopedia Canada. Toronto, Grolier, 1957-1958. v. Illus. Bassett, John and Petrie Roy. Laura Secord. Toronto, Fitzhenry and Whiteside, 1974. 62 p. Illus. Choquette, Robert. Ontario: An Informal History of the Land and Its People. Toronto, Ministry of Education, 1983. 48 p. Illus. Bayer, Fern. The Ontario collection. Toronto, Fitzhenry and Whiteside, 1984. 388 p. Illus. Black Creek Pioneer Village. Black Creek Pioneer Village proudly present: The Parks Canada Loyalist Exhibit, Daily August 26 to September 3. North York, the Village, 1984. 1 p. Illus.